Passed away peacefully at SCGH surrounded by his family, 20.3.2019. United with his Brother Neil. Will always be in our hearts. Love to all our families and friends. Love knows no boundaries it walks beside us everyday. 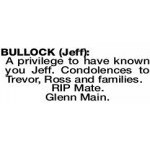 The Funeral Service to celebrate and honour the life of Mr Jeff Bullock of Beldon will take place in the East Chapel at PINNAROO Valley Memorial Park, Whitfords Avenue Padbury at 1.30pm on FRIDAY (05.04.2019). BULLOCK JEFF My mate my brother. I will miss you but know you are now at peace with Neil. Love Trevor Kathy and family. 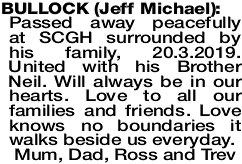 A privilege to have known you Jeff. Condolences to Trevor, Ross and families.